Hosted by Sweet Honey in the Rock's Ysaye Maria Barnwell. Mississippi Fred McDowell, Ray Bryant, Paul Robison, Chuck Berry, Stevie Wonder, the Isley Brothers, Duke Ellington, Bing Crosby, Bessie Smith, Pete Seeger, Eubie Blake, Louis Armstrong and many, many more. 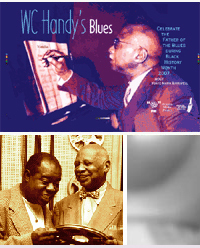 Click here to learn more about WC Handy, hear full interviews of guests featured and view more photos.